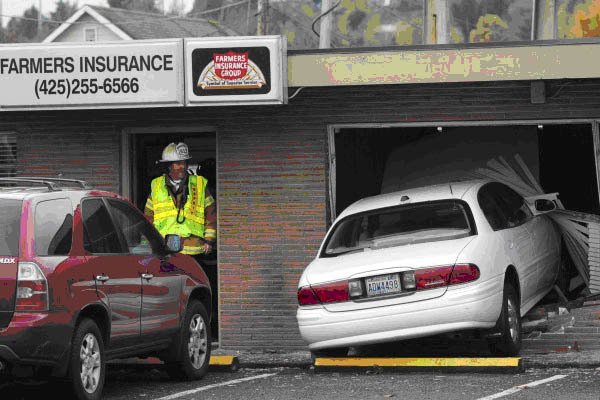 Tragedy struck in Renton, Wash., last month when an 80-year-old driver crashed her car into a Farmers Insurance office, pinning office manager Kaye Hall. First responders were unable to revive her. Note the yellow-striped wheel stop (aka 'bumper stop') at the head of the parking space in this Seattle Times photo of the accident scene. As parking design experts have told me in the past, wheel stops don't actually stop or prevent a vehicle from moving forward. While the devices might serve as a guide for cautious drivers slowly inching forward toward the head of the parking space, bumper stops can serve to launch a vehicle up and forward if the driver hasn't come to a full stop. Note also the nose-in (aka 'front-in') parking configuration. With no effective barriers/bollards between the parking spaces and the building, the people occupying those offices are sitting ducks for another crash of this type. According to news reports, this accident was under investigation and no charges against the driver were announced ahead of its conclusion.